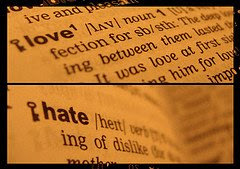 i am trying to understand the relationship between love and hate , and how each of them affect the human’s behavior! these some of the question that pop up in my head! Is it possible for Love and Hate to be together? Is it possible to love a person and hate him in the same time? do you think we should HATE and LOVE fully or partly? when we hate a person, should we hate his religion, his ideologies, his family and everything that is related to him? share your thought here !